FreeNAS® is an open source community, relying on the input and expertise of users to grow and improve. When users take time to assist the community, their contributions benefit everyone. This section describes how to participate and contribute to FreeNAS®. It is by no means an exhaustive list. If you have an idea that will benefit the community, bring it up on one of the resources mentioned in Support Resources. FreeNAS® is developed and documented in English. Having complete translations of the user interface into other languages helps make FreeNAS® much more useful to communities around the world. 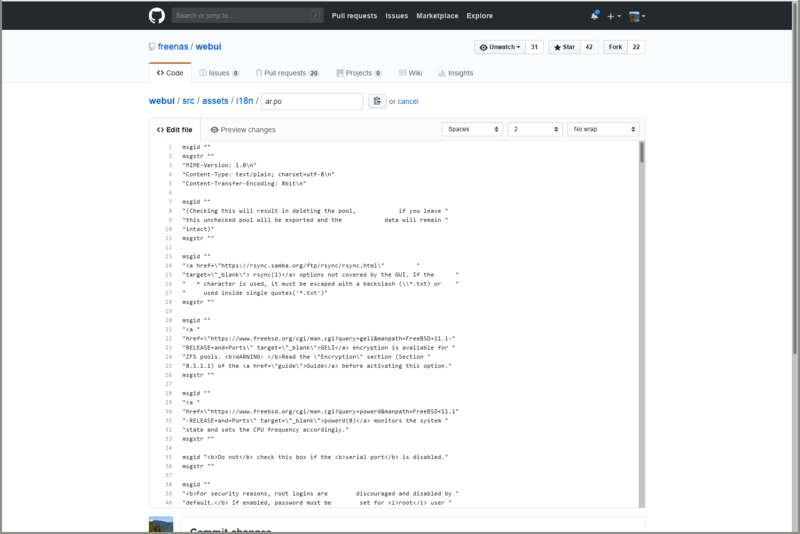 FreeNAS® uses .po files stored in the webui GitHub repository to manage the translation of text shown in the FreeNAS® graphical administrative interface. GitHub provides an easy to use web-based editor, making it possible for individuals to assist with translation or comment on existing translations. To view translation files, open the /src/assets/i18n directory of the FreeNAS® webui repository, as shown in Figure 22.1.1. To assist with translating FreeNAS®, first create an account with GitHub. 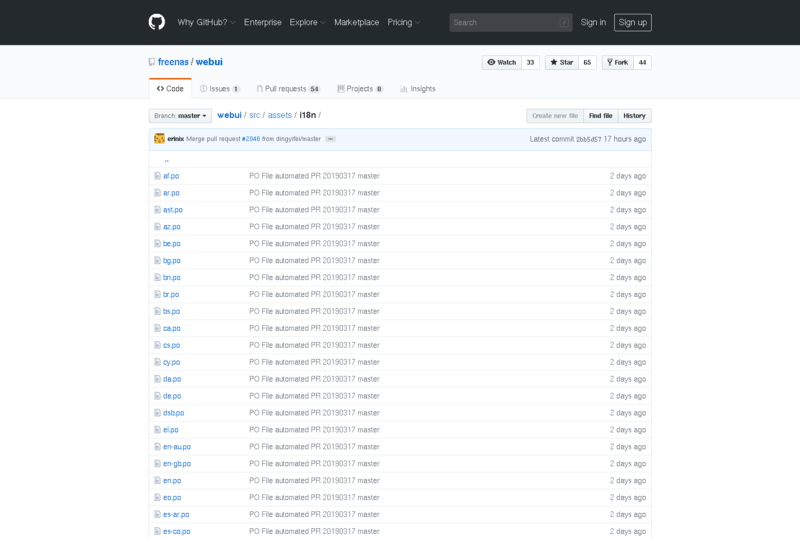 Edit po files and submit pull requests through the GitHub website. Copy the freenas/webui repository, make changes using a po editor, and submit these changes back “upstream” to the freenas/webui repository. Go to the freenas/webui repository. Select src ‣ assets and click the i18n directory. Click on the desired language po file to begin translating. There are numerous msgid "" and msgstr "" entries in the file. Read the msgid text and enter the translation between the msgstr quotes. Scroll to the bottom of the page when finished entering translations. Enter a descriptive title and summary of changes for the edits and set Create a new branch. Click Propose file change to submit the translations to the FreeNAS® project. Install Git. There are numerous examples in these instructions of using git, but full documentation for git is available online. The download can take several minutes, depending on connection speed. Type git status at any time to see which branch of the repository is active. Use a po editor to add translations to the desired language file. Any capable editor will work, but poedit and gtranslator are two common options. Enter a descriptive message about the changes and save the commit. Writing objects: 100% (6/6), 8.56 KiB | 4.28 MiB/s, done. Open a web browser and navigate to the freenas/webui repository. GitHub automatically detects when a new branch is pushed to the repository and displays a message with an option to Compare & pull request. Click this, review the changes, and click Create pull request. The FreeNAS® project automatically tests pull requests for compatibility. If there any issues with a pull request, either the automated system will update the request or a FreeNAS® team member will leave a message in the comment section of the request.